With smartphones and other mobile devices an integral part of our everyday living, it’s easy to forget that it can be challenging for seniors to take advantage of all the benefits these devices can provide. As phones and tablets get smaller and more feature-packed, anyone who has trouble seeing or using tiny controls will feel frustrated and marginalized by these rapidly-evolving communication tools. The problem can be compounded by the growing trend away from older, clamshell-style feature phones to smartphones – those powerful minicomputers-in-a-phone that even non-senior adults can find challenging. With over 45.5 million people in the US alone owning smartphones, it’s no surprise that many seniors would prefer to have one if they could use it properly. Simple controls that include easily-understood buttons, intuitive navigation, and as few options as possible to minimize confusion and avoid mistakes. Manageable size and shape that a senior can carry and handle easily. “Phablets,” those quasi-phone-tablet devices, are growing in popularity, but their size can be problematic – too big to fit anywhere easily for a phone, but too small to be useful as a tablet to a senior. These powerful devices can also be on the heavy side for someone not used to carrying a piece of technology around all day. Bluetooth This short-range wireless connectivity technology can be a boon for seniors who are hard of hearing and can’t — or don’t want – to hold a device to their ear for any length of time. By using an earpiece instead of the phone’s speaker, seniors can have convenience and clarity with the hands-free security that enables them to use both hands while talking. Cell phones are available that offer hearing-aid compatibility, so if your senior phone user has a hearing aid, look for a compatible make and model and check the ratings — M for microphone and T for tele-coil coupling. The higher the number, the higher the rating. Easy-to-use buttons can be crucial for seniors who may have trouble negotiating a touchscreen. This is especially true for seniors who may want to use their smartphones for emailing and will find it easier to use a phone with the option of a traditional QWERTY keyboard. Large screen This is often the major requirement for many seniors. Age-related vision deterioration is a major obstacle for technology use among seniors. Large screens make it easier to read larger type, understand commands, and perform tasks on a smartphone. Armed with this information, you’re ready for smartphone shopping. 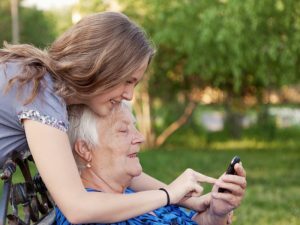 The good news is, many mobile phone companies are recognizing the growing senior population with special phones, plans, and pricing for seniors. There are some good choices and options available out there. This entry was posted in News, Tips and tagged cellphones, elderly, phones, seniors, smartphone. Bookmark the permalink. Both comments and trackbacks are currently closed.